Having done an introduction to the introduction to Proverbs, last Sunday I began an actual introduction to Proverbs. I skipped over the first Hebrew word of the book ("Proverbs-of"), to focus on "Solomon son of David king of Israel." 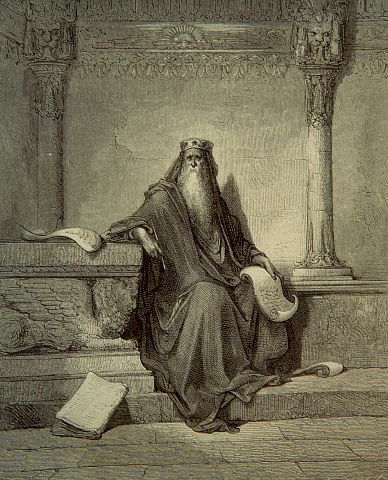 Titled The Pithy Penmen of Proverbs, my focus was the central author and overall editor, King Solomon. 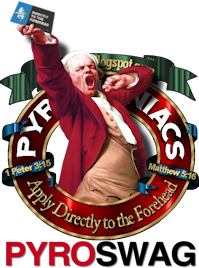 As I'm sure I've remarked somewhere before, I find Solomon one of the most frightening, sobering men in all of history, in the company of men like King Saul, fallen pastors, and the head of the pack, Judas Iscariot. In Solomon's case, was there ever a man who was more advantaged and fell further — apart from Judas? In the sermon, I traced his lineage, his beginnings, his encounters with God, his accomplishments... and his disgraceful fall. 1. Do love God with everything you’ve got today, now. 2. Do cling to God as if all the demons of hell are trying to pull you away. 3. Do learn God’s word like there’s going to be a test. Because there will be. a. Yesterday’s spirituality and devotional is a wonderful thing – if you’re building on it today! b. But if not, all it is is a towering, damning monument to our declension, a sad comment on how far we’ve fallen, like the religious buildings of Europe. 2. Don’t relax your guard until the General says the war’s over. 3. Don’t think you’re home until you’re actually at Jesus’ feet. 4. Don’t stop studying, learning and doing until the Master says to put your pencil down...which will probably never happen. Looking forward to listening to your Proverbs series, Dan. 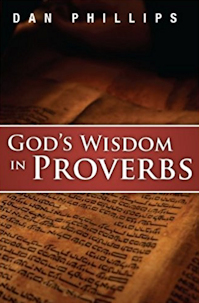 There aren't very many Proverbs series out there (from solid expository preaching churches). Do you know how many lessons it will involve (or is that still unknown, a work in progress)? Honestest answer: everything I do's a work in progress until it's done. 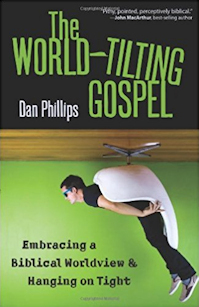 Really admire pastors who can plan those things out to a T. I'm not (yet) among their number. As I read "A.2", I said, "Oh, I'm going to copy and paste that as I comment. But then I got to "A.3" and said, "Oh, that's a good one, too!" By the time I got to the end, I would have had to copy and paste your whole post, which would be silly. "Don’t live on yesterday’s devotion"
2. I've never regretted forcing myself to pick it up and begin, when I didn't "feel like it". Because, "all the demons of hell are trying to pull you away". Thanks, Dan. Look forward to hearing the series, and reading your notes, as wisdom keeps shouting in the streets and square, "How long, O naive ones, will you love being simple-minded?" I'm notorious for dragging my feet on Bible reading, so I was grateful that my church put out a little annual Bible-reading schedule pamphlet that I'm now following. When I fall off the wagon ('cause I do, of course), I'm able to catch up easily as long as I don't skip more than a day. Yes, I know that sounds terrible. On a semi-related note, I've always been creeped out by the mystery surrounding Solomon's fate; we never read of any repentance in the Scriptures. Despite God using him to write large chunks of His Word, did he wind up in Hell? Is there any way we can deduce from the Bible what became of him? Or is that silence meant to be there to just make us plain terrified? I think B, or whatever letter your last sentence would be. I think there's reason to hope that Solomon came to repentance, and to read Ecclesiastes as echoing and framing that repentance. But, that said, even the abominable Manasseh repents, and his repentance is recorded in Scripture. One has to deal primarily (if not solely) with the text as-is. So I conclude that what the Holy Spirit primarily wants us to take from the course of Solomon's life is that sin can snare even the wisest, most accomplished and most richly-advantaged. David shows how God can forgive the repentant of anything; Solomon shows that no place this side of Heaven is safe. 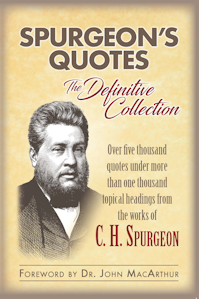 "You won't meet anything uglier than yourself"
"Assuming Jesus lied and is dead..."
Spurgeon — as guest preacher?